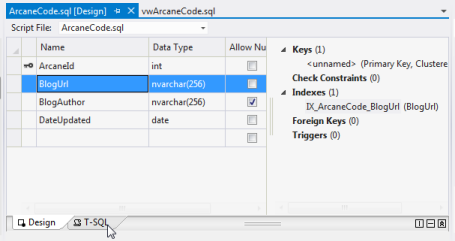 With this post I want to show you a few of the nice shortcuts provided to you in Visual Studio SSDT for quickly customizing the layout of your designers. 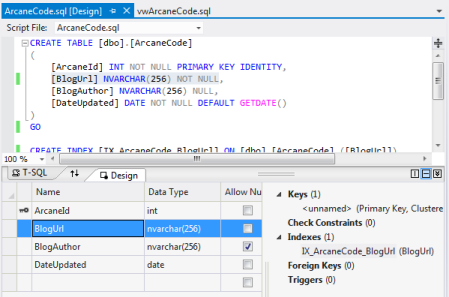 A few of the items only apply to the table designer, but many apply to other windows within Visual Studio, no matter what project type is being hosted. The double bar pointed to by number 2 is the resizing handle. 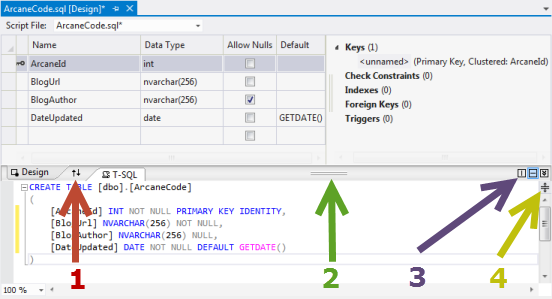 Click and drag to adjust the amount of space used by either pane. Note the change of the cursor shape when it’s hovered over the double bars. There are three buttons pointed to by number 3. The middle one is the default, and indicates you want to split the panes horizontally. If you click the left most of these 3, it will split the panes vertically. Vertical mode is really nice when you have a super wide screen monitor. As you can see, the three buttons have now shifted to the bottom center of the screen, next to the mouse in the above image. What if you are working on a really small screen, and don’t even have enough real estate to work comfortably with any size split? Well that’s where the right (or bottom if vertically split) button comes in. Click it to shift to tabbed mode. (Note, I suggest you shift back to the default horizontal split first, otherwise the tabs will be on the right instead of the bottom and not quite as easy to use). 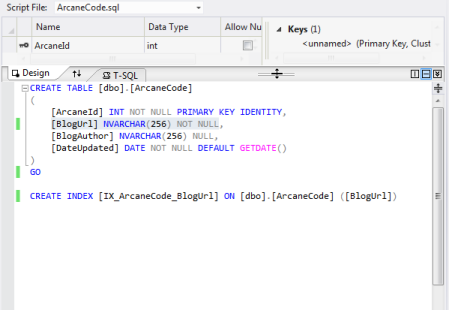 The last button, number 4, is for the T-SQL pane. 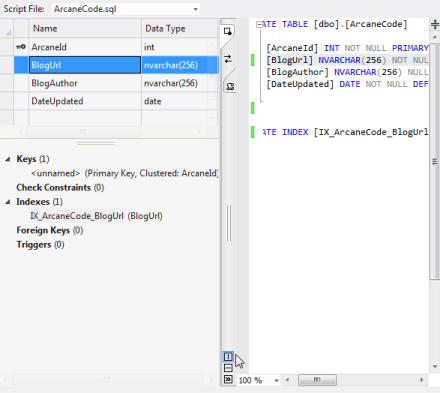 It’s also found in almost all code editor windows in Visual Studio. Using it you can split the code view so you can see two different sections of you code at the same time. Great for working with especially large code bases. And this split should exist in any text editor, not just the designer. Whether it’s straight T-SQL, VB.Net, C++, F#, or C# it should work for you. For a typical desktop user, you’ll probably set these once and forget. But for folks like me who travel a lot, these are a real blessing. When I’m at home, with my laptop hooked up to my 25inch wide screen monitor, I can quickly shift to split screen vertical mode to take advantage of all that width. When I’m on the road though, working on my laptops small screen (12 inches), I can shift back to horizontal mode, or more often (for me) tabbed mode, for doing my work. Experiment with different layouts, and find out what works best for you!